This window displays the image properties of the image under the mouse in the image viewport. World Position of the mouse in the canvas. Position Position of the image in the canvas. Pivot Relative pivot of the image. Pixel Pixel of the image under the mouse. 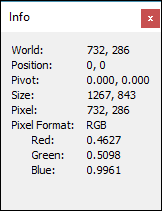 Pixel Format The pixel format of the image. Channels The channel values of the pixel.